What are the benefits of connecting all Human Capital Management processes into one system? Bringing the various HCM processes under a single software platform provides numerous benefits for businesses. First, it enhances collaboration by connecting traditionally separate departments such as Human Resources, Sales and Marketing, Engineering etc. together into one single work system. Employees can directly manage benefits and request sick leave, time off, management can share insights and performance metrics across departments and with employees, HR and management can collaborate throughout performance and salary review processes, and HR can identify best practices for recruiting new talent as well as their ongoing training. A single HCM platform makes it very easy and convenient to locate information across departments. 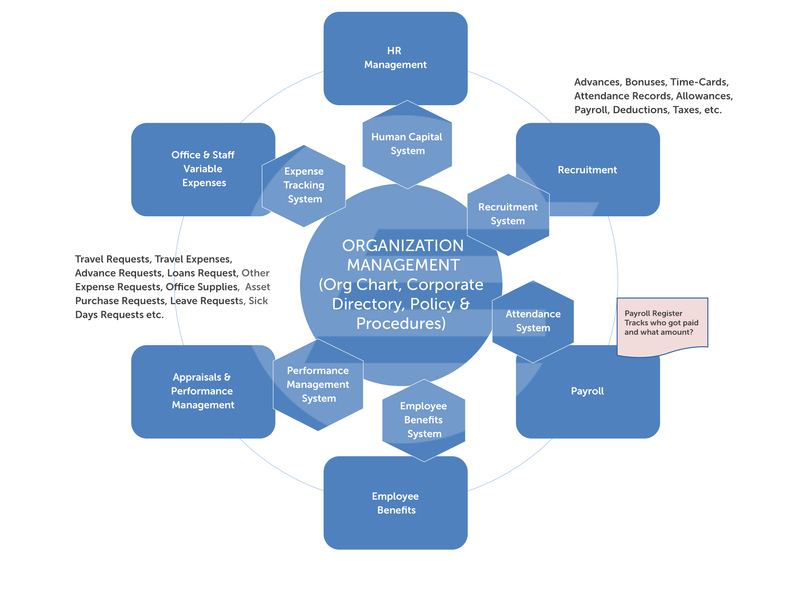 What tools does Human Capital Management software provide for Human Resources? HCM software streamlines and simplifies almost every aspect of HR. Recruitment becomes largely automated and employee retention is improved through smarter training and onboarding processes. Not only do human capital management solutions help HR share workflows and processes, but these apps allow for more self-service capabilities and social tools for employees. Some features of human capital management systems include performance reviews, goal management and compensation planning, as well as the automation of time collection and absence management. Human capital management allows HR to forego spreadsheets and enables accurate historical, current or future records to be recorded. Benefits programs are also largely automated and are easier to define and manage. For example, updates to dependents and beneficiaries are much quicker to process. Why do companies choose cloud-based HCM solutions? Cloud-based HCM platforms reduce costs yet offer greater mobility and connectivity. The Internet allows communicating with employees convenient such as making scheduling changes or sending an employee his or her monthly performance review online. Companies also save on IT costs by eliminating the need for additional servers, storage, networking staff and above all expensive software upgrades. If you manage a global workforce, you no longer need different solutions for every country – HR can take care of any task from anywhere in the world. What are the benefits of BES HCM on a Cloud Platform? The Business Efficiency Cloud Platform is intuitive, user friendly and easy to communicate on, making it the perfect fit for your HCM needs. Even better, the Cloud platfor(s) are run by thousands of businesses already. The Cloud Platform also allows you to share workflows and approval processes across the company. Shared reporting and analytics tools across the company make for easier collaboration and smarter decision-making.